An initiative by Community Social Planning Council of Greater Victoria, Fraser Basin Council's Smart Planning for Communities program and Transition Victoria. Generously supported by the Vancouver Foundation. First phase of Building Resilient Neighbourhood project is now complete and final report covering some of the research and approaches, as well as lessons learned can be downloaded here. During the first phase, Building Resilient Neighbourhoods project engaged participating community members, local governments and organizations through workshop series exploring ways to build community resilience and meet basic needs closer to home. These workshops explored a range of topics, including: expanding local, cooperative, and self-reliant community networks, strengthening social ties and community cohesion, and operating in greater harmony with ecological limits. During the first phase of the project, approximately 200 people from 38 different Greater Victoria neighbourhoods participated in the in-person workshops, and more than 95 people participated from around the province in webinar learning sessions held in March. A number of learning tools and resources for participants, community members, and local governments were developed, including reading lists and case study examples. 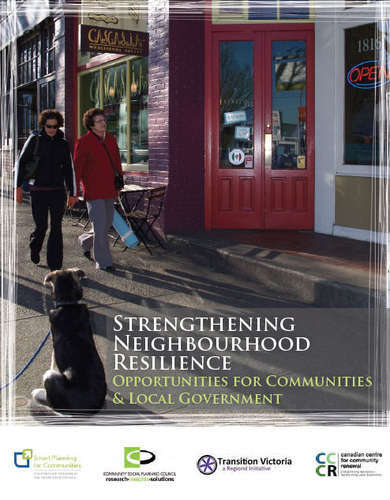 A checklist tool with “Characteristics of a Resilient Neighbourhood” was developed to help guide neighbourhoods in assessing gaps and opportunities for improvement (available at www.communitycouncil.ca). In the second phase of this project, a demonstration neighbourhood in the Capital Region will be chosen as a pilot area to demonstrate concrete social, environmental, and economic outcomes achievable through a resilience framework. The next phase of the project will also bring about collaboration with local governments in order to assess possible relationships between project’s next phase and local area and neighbourhood planning processes.